Hero MotoCorp has beaten Honda Motorcycle & Scooter India to emerge as the country’s largest scooter exporter four years after parting ways with its erstwhile partner and venturing into international markets. 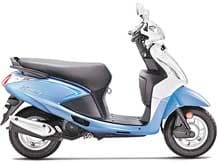 This development is a damper for Honda Motorcycle & Scooter, whose popular scooter brands like the Activa helped it lead the Indian scooter market by a wide margin. Scooters account for almost 60 per cent of the monthly production at Honda Motorcycle & Scooter. Hero MotoCorp, India’s largest two-wheeler maker with a 40 per cent share of the 16 million unit market, exported 84,690 scooters in 2014. This is an almost five-and-a-half times jump over 2013 when it exported just 15,776 scooters. Honda Motorcycle & Scooter saw an 85 per cent rise in 2014 scooter exports to 79,184. Hero MotoCorp has two scooter models, the 100cc Pleasure targeted at women and the 110cc Maestro aimed at men, and is gearing up to launch two more scooters this year, the 110cc Dash and the 125cc Dare. Its share of the scooter market in India is 16.5 per cent, while Honda Motorcycle & Scooter has 55 per cent. Honda Motorcycle & Scooter sells the 110cc Aviator and Dio, apart from the Activa, which is available in 110cc and 125cc variants and is the top-selling scooter model in the country with monthly sales of about 150,000. For a few months last year, the Activa had also displaced Hero MotoCorp’s Splendor motorcycle as the top-selling two-wheeler model. Hero MotoCorp’s foray overseas started after 2010 when its New Delhi-based promoters the Munjals announced they would buy Honda’s 26 per cent stake in the company. Since then it has expanded into several markets in South America and South-East Asia. Last year it announced construction of overseas assembly plants in Colombia and Bangladesh. Hero MotoCorp also aims to build plants in Argentina and Brazil and start sales in developed markets like Europe and the US by 2016. Driven by demand from small towns in India, where fuel efficiency sells, the scooter segment has done exceedingly well in the past few years. In 2014 scooter sales in the country rose 29 per cent to 4.32 million, while motorcycle sales were up just 6.2 per cent to 10.91 million. 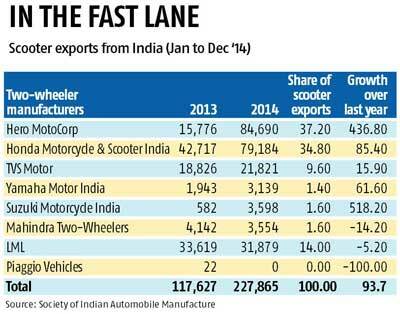 The overall two-wheeler market grew 11.5 per cent to 16 million units during the year.